You can manage projects and assign tasks to team members by adding task lists and calendars to your team site. 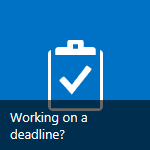 Click the Working on a deadline? tile on the Get started with your site web part. This adds the Tasks and Calendar apps to your team site. Next, you might want to share your files with others who may be involved or interested in your project. If the right people already have access to your team site, then you can dive into project planning. The first step in planning a project is to add tasks and assign them to people. As you add your tasks, you may find that you need different fields to capture specific information. You can easily add columns to the task list. Want to set up the timeline? Here’s how to add tasks to the timeline and change the appearance of the timeline. Want to add structure to your task list? Here’s how to indent, outdent, move, and delete tasks. Want to work with your task list in Microsoft Project or Microsoft Excel? Here’s how to open a task list in Project or Excel. Want to add files to your project? Here’s how to upload, view, and remove project files or documents. Want to see a high-level view of your project? You can view your project’s tasks and events in the Project Summary web part. While a team site may be just the right place to manage projects for some people, others may benefit from managing projects using a project site, or by using Project Web App.